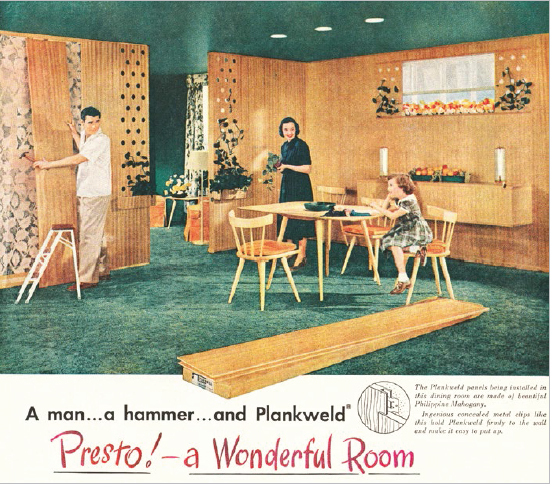 Back in 1953, this ad for Plankweld paneling called out to men with hammers. "The redwood was soft," recalls Aaron Wheeler, a carpenter who worked for Eichler from 1951 to 1965 who remembers well the original redwood panels. "It's your wall covering, it's in your house. You bang a chair against it…." "Mahogany would be tougher," he adds. "It's pretty too." Eichler chose Philippine mahogany for its strength and appearance, Ned said, but the product from the Philippines "was not good enough," so Eichler had a Japanese firm, C.T. Takahashi & Co., based in Seattle, arrange to "mill it to our specifications." Ron Key says, "No one else used that product as much as Eichler did. In the early 1950s, most builders were using drywall." Throughout the 1950s and into the early 1960s, Wheeler recalls, plywood was used throughout the homes. Some interior sheathing was a continuation of the exterior redwood panels; and masonry walls were used, but not sheetrock. Wheeler was part of a two-man crew that put each sheet of plywood in place. The sheet was a one-quarter-inch thick, three or four ply. "The bigger houses used 150 sheets," he says. He and his partner carefully eyed each piece, deciding which side looked best and should face out. "The front is beautiful, usually," he says. Sheets ranged in color from "real red" to "light orange." In arranging the sheets they paid attention to color and to the figuration of the grain. "We wanted the grain and everything to match." "We would pull out the sheets for each room, and we would try to match the color of every room," Wheeler says. They would place particularly dark sheets in living areas where sunlight would be most intense. After beveling each sheet to achieve a good fit, Wheeler and partner would be followed by the nailer, then by the painter, who would cover the sheets with Cabot stain wax (no longer produced today). "It was transparent, but it gave a good finish," Wheeler says. "It didn't change the color very much, but it blended all the sheets together." "The goal was to make the wall look like a single piece," he says. The mahogany panels became a selling point. "Designed with children in mind," bragged one full-page Eichler magazine ad in 1955. "Philippine mahogany wall paneling, wax-stained, resists little fingerprints, wipes clean with damp cloth." As the years went on, the amount of Philippine plywood used in the homes decreased, with sheetrock used instead in bedrooms and baths, Wheeler notes. But, as Eichler's longtime construction foreman Bill Willis once said, "Joe Eichler really loved that wood paneling." The panels popped up in all of Eichler's projects—even in the Summit, a concrete San Francisco luxury tower where Joe and his wife lived. Today it's hard to find much plywood remaining in that building. "After about 1962," says Frank LaHorgue, who had worked for Eichler Homes and eventually bought a home in Eichler's Upper Lucas Valley tract in Marin, "[Eichler] wasn't using as much lauan, not in Lucas Valley. My house is almost all sheetrock except in the living room, where he brought the exterior siding through." "I don't know why he stopped using the lauan. It could be that people were objecting to it, maybe new buyers." But LaHorgue remains a fan, remembering his first Eichler. 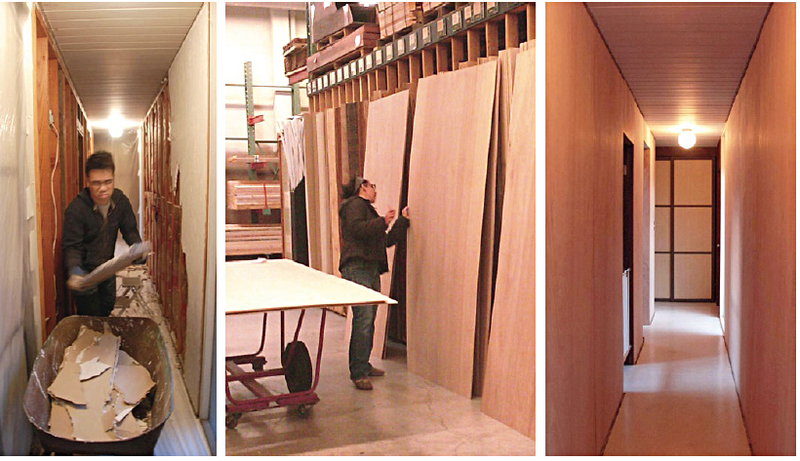 "I picked out the lauan panels. The ones I picked had lots of patterns and lots of texture—and it was great." "To me, the alternative, of [having walls of] sheetrock, is kind of dull, because there's quite a bit of variation in the natural lauan panels. When they were natural [with their finish], they were great. I thought they were beautiful."